There is a growing interest and use of virtual worlds for both entertainment and academic research. Worlds such as Second Life and World of Warcraft attract thousands of users and have both virtual and real world economies. Such virtual worlds have come a long way since the original text worlds such as Zork (known as MUDS), they have developed into 3D immersive environments, where users can chat using both voice and text. Virtual worlds can be broadly broken down into two distinct categories, the first being game focused such as World of Warcraft and Star Wars Galaxies (e.g. MMORGs). The second type being socially focused such as Second Life and Active Worlds (e.g. Massively Multiuser Virtual Environments). Such virtual worlds have a great potential as sites for research in the social, behavioural, and economic sciences (see Bainbridge (2007), The Scientific Research Potential of Virtual Worlds). Universities are using them to promote themselves and exploring there use for teaching (e.g. Ohio University, see the movie below). While others are using virtual worlds for military applications, such as combat simulation (see movie below) or for studying the spread of epidemics (e.g. Kafai et al., 2007). For the geographer, the ability of people to create their own land and build their own houses leads to the creation of a digital geography and research can be carried out in topics such as of urban sprawl and the development of ghost towns were land and buildings have been abandoned by their original inhabitants (see Dodge and Kitchin, 2001 for more information). Ohio University Second Life Campus. Military applications within virtual worlds: large scale simulation of real world battle fields in Second Life -Iraq. My own interest in virtual worlds arises because they offer a new arena to explore agent-based modeling for the social scientist, they can be viewed as a digital laboratory where real world landscapes (including buildings, roads, terrain) can be imported and explored thus moving away from an artificial laboratory on ones desktop into a more collaborative 3D environment comparable to a real-world laboratory accessible by others, who are able to visualize and discuss issues such as pedestrian egress from buildings in real time or taking one of the examples above, imagine using agents as the enemy within combat simulations. 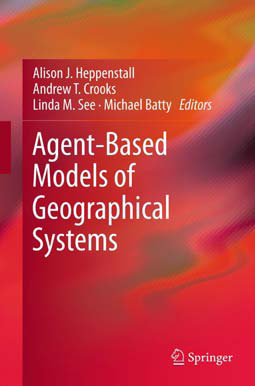 Examples of agent-based models in virtual worlds include ant foraging (Tectonic 2007, see the movie below) or herding behavior of sheep (Merrick and Maher, 2007). While our own work at CASA explores three simple agent-based models as pedagogic demonstrators and as a “proof-of-concept” (see the movie below), including Conway’s Game of Life, Schelling’s (1978) Segregation model. These models were chosen as they highlight how classical automata styles of models which have inspired a generation of modelers can be created and explored in Second Life. The third model is a prototype pedestrian evacuation model which is more complex than the previous two and highlights how a variety of models that can be created in Second Life and potentially linked to real world places such as football or underground stations. 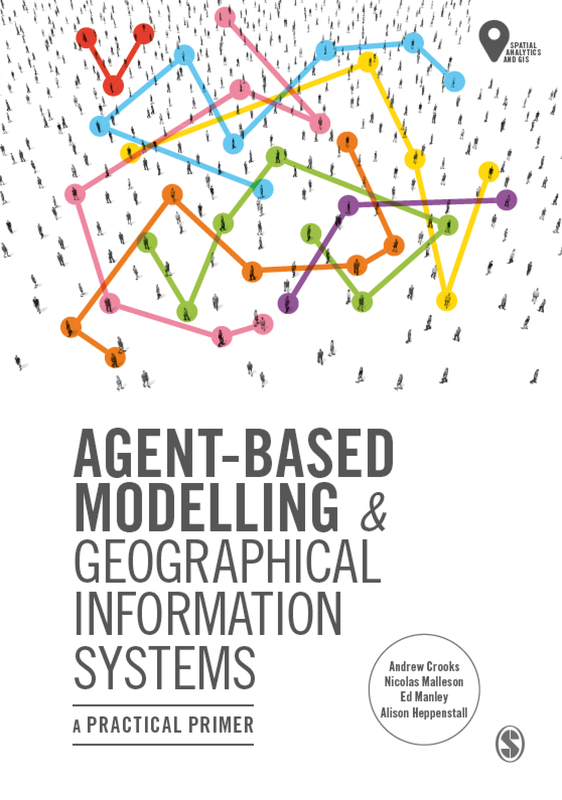 This model relates to the genus of such models of which the social forces model developed and popularised by Helbing and Molnár (1995) is typical. While virtual worlds offer much potential there are still problems such as the need of land (maybe OpenSim can help here? ), deficiencies of the internet (e.g. bandwidth, package delivery etc. ), server side delays, limited script sizes, etc. Nevertheless, there is the potential to build realistic cities using real world data, populate such cities with agents and see how the city might evolve over time. There is also the potential to use evolutionary computation for such modeling. For example the movie below is by Karl Sims and shows results involving simulated Darwinian evolutions of virtual block creatures who are tested for their ability to perform a given task. The successful survive and make offspring for a new population. As this cycle of variation and selection continues, creatures with more and more successful behaviours can emerge (see Evolved Virtual Creatures,1994). Darwinian evolutions of virtual block creatures (Evolved Virtual Creatures,1994). For those interested, I found this site a useful resource for understanding virtual worlds entitled "Designing Virtual Worlds" by Kathryn Merrick. Any thoughts, comments or links are more than welcome. Bainbridge, W.S. (2007) The Scientific Research Potential of Virtual Worlds. Science. 317(5837): 472-476. Dodge, M. and Kitchin, R. (2001) Atlas of Cyberspace, Addison-Wesley, London, UK. 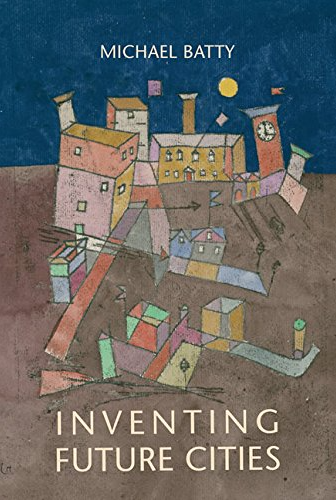 Kafai, Y.B., Feldon, D., Fields, D., Giang, M. and Quintero, M. (2007) 'Life in the Times of Whypox: A Virtual Epidemic as a Community Event', in Steinfeld, C., Pentland, B., Ackermann, M. and Contractor, N. (eds. ), Proceedings of the Third International Conference on Communities and Technology, Springer, New York, pp. 171-190. Helbing, D. and Molnár, P. (1995) Social Force Model for Pedestrian Dynamics, Physical Review E, 51(5): 4282-4286. Merrick, K. and Maher, M. (2007) Motivated Reinforcement Learning for Adaptive Characters in Open-Ended Simulation Games. Proceedings of the International Conference on Advances in Computer Entertainment Technology. Salzburg, Austria, pp. 127-134. Schelling, T.C. (1978) Micromotives and Macrobehavior, WW Norton and Company, New York, NY. I believe that future buildings will be created by entering the site information and materials available into an evolutionary computation which will deliver the strongest building with the least resources. The same could be said for city planning. And I want to be a part of that process. Talk to you soon. I first wanted to say that OpenSim as an alternative to Second Life is not quite there yet. I use OpenSim in my own research, and why some of the basic functionality of SL is there, there's quite a bit missing, and many functions you might want simply don't work. I'd categorize it as "good enough... sometimes." Second, as a researcher in psychology, it's necessary to consider whether certain behaviors would be expressed the same way in SL as they are in the real world before moving a real-world experiment to a virtual environment. For example, if you're interested in how emotional reactions affect eyewitness testimony when reporting a car accident, people likely don't have the same reactions viewing a virtual car accident in SL as they would if they really saw a car accident in-person. And while that's a pretty obvious example, it's unclear exactly where the line of "good enough" is crossed.